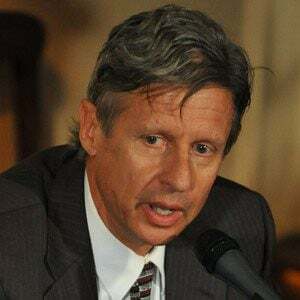 New Mexico's 29th governor from 1995 to 2003 who ran for the office of President of the United States on the Libertarian Party ticket in 2012 and 2016. Before running for Governor in 1994, he had no prior political experience. He turned his small door-to-door selling business into one of the largest construction companies in the state. Before running for president, he called attention to America's rising national debt and dangerous financial situation. He built his own home in Taos, New Mexico. He was married to Dee Simms from 1977 until 2005. He is close with libertarian politicians Ron Paul and his son Rand, frequently appearing at Ron Paul rallies and endorsing Ron for the Republican nomination.